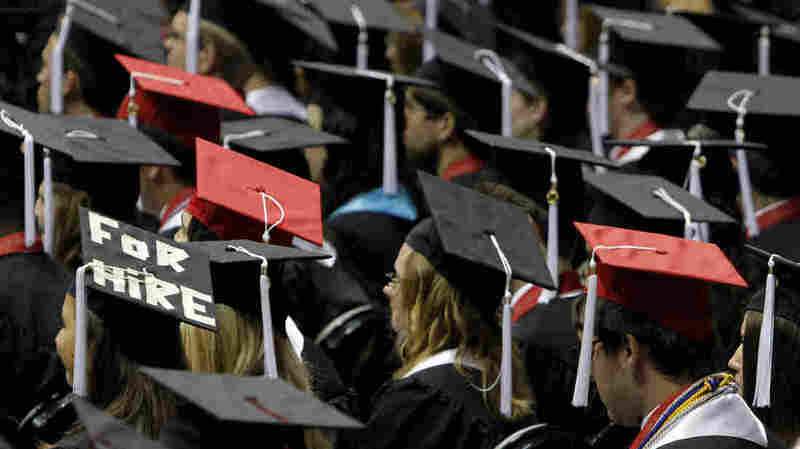 States Review Laws Revoking Licenses For Student Loan Defaults Montana could soon dial back laws that allowed defaulters to have their professional and driver's licenses revoked after failing to pay back debt. In 22 states, people who default on their student loans can have professional licenses suspended or revoked. The percentage of Americans who default on student loans has more than doubled since 2003. Clementine Lindley says she had a great college experience, but if she had it to do over again, she probably wouldn't pick an expensive private school. "I could actually buy a small home in Helena, Mont., with the amount of debt that I graduated with," she says. "Removing my driver's license, you just created one more barrier for me being a productive citizen in my community." Fresh out of school, Lindley says there were times when she had to decide whether to pay rent, buy food or make her student loan payments. "There was a time where I defaulted on my student loans enough that I never was sent to collections, but just long enough to, honestly, ruin my credit." That was motivation enough for Lindley to figure out ways to make her payments. But had she defaulted longer, the state of Montana could have revoked her driver's license. In 22 states, defaulters can have the professional licenses they need to do their jobs suspended or revoked if they fall behind in their student loan payments, licenses for things like nursing or engineering. The percentage of Americans defaulting on their student loans has more than doubled since 2003. That's putting a lot of people's livelihoods at risk. But Montana, where Lindley lives, is rolling those sanctions back. When Democratic State Rep. Moffie Funk learned that that was a potential consequence, she says she felt embarrassed. "I think it is demeaning," she says. "I think it is unnecessarily punitive." Not to mention, she says, counterproductive. If the goal is to get people to make loan payments, taking away their ability to drive to work just makes it harder for them to make money, especially in rural states. "There isn't public transportation, or very little," Funk says. "You know people need cars in Montana." So Funk wrote a bill ending the state's right to revoke professional or driver's licenses because of student loan defaults. Dustin Weeden, a policy analyst at the National Conference of State Legislatures, says a lot of states passed license revocation laws for student loan defaulters in the 1990s and early 2000s, back before the federal government started taking on a bigger role in lending to students. "Because states were essentially the direct lenders to students, many states had large loan portfolios," he says. Weeden adds that tying student loans to licenses, which often have to be renewed every couple of years, created a process to find people when they defaulted. "The state loan authorities would report anybody who had defaulted on loans to all the licensing entities around the state," he says. "Then it's a way for a state to identify that person and really help them get into repayment." But some policymakers want to retain consequences for defaulting. Like Republican State Sen. Dee Brown. "I think that this is one of the sticks that we can use over a kid who is not paying their student loans," she says. "It's a stick to get their attention. And what a better way than their driver's license?" There are plenty of sticks already, like having your wages garnisheed and your credit ruined, says Lindley. "Removing my driver's license," she adds, "you just created one more barrier for me being a productive citizen in my community." The Montana bill to take away license revocation as a consequence for student loan default passed with bipartisan support. That wasn't the case in Iowa. An attempt to repeal a similar law there failed earlier this year.